The Purge has become one of the most successful modern horror franchise we have. A very unique and fascinating premise has propelled the series to three very successful movies so far, with an upcoming Purge 4 slated for release on July 4, 2018. Series creator James DeMonaco has now officially confirmed that the upcoming fourth entry, which is going to be a prequel, is officially titled The Purge: The Island, while also revealing the first official plot details. James DeMonaco made the reveals about The Purge 4 while speaking with Vulture. Even though he isn't directing this time around, as that duty has been handed off to Gerard McMurray (Burning Sands), DeMonaco is heavily involved. He revealed that this movie will tell the story of the first ever experimental Purge night, which is going to take place on Staten Island. Here's what he had to say about it. "I said it's the first experimental Purge, which I don't know if I was supposed to say, but now I've said it, so you have it. Next July 4, it'll be coming." One question that is often raised about The Purge movies, and it's a reasonable one at that, is why don't people just leave during the annual night of government sanctioned crime? This movie may not explore that entirely, but The Purge: The Island will at least explain why people were willing to stick around for this first experimental night of violence. The answer, according to James DeMonaco, is actually quite simple; money. "I was wondering how you get people to stay for the first Purge, and what they do is they start monetizing it. People from Staten Island can easily go to Brooklyn for the evening, so what they do is start promising very decent sums of money for the very poor people in the neighborhood. It becomes a monetization of murder and violence, incentivizing killing and keeping people around for them to be victims. So you see the inception of how grotesque the idea of the Purge is, and the manipulation upon the society." The Purge has always been an inherently twisted concept, but that takes things to a new level. Though, that could be a good thing heading into The Purge 4. After the third movie, The Purge: Election Year, some elements of the series started to feel a bit tired. Exploring this new side of things and seeing how all of this got started, with the added twist of incentivized killing, could give the series the breath of fresh air it needs to keep going. Since James DeMonaco is also working on a Purge TV series, that will be beneficial, if they can pull it off. The Purge movies have made a combined $315 million at the box office. Considering they have a combined production cost of just $23 million, they have been big time earners for the studio. 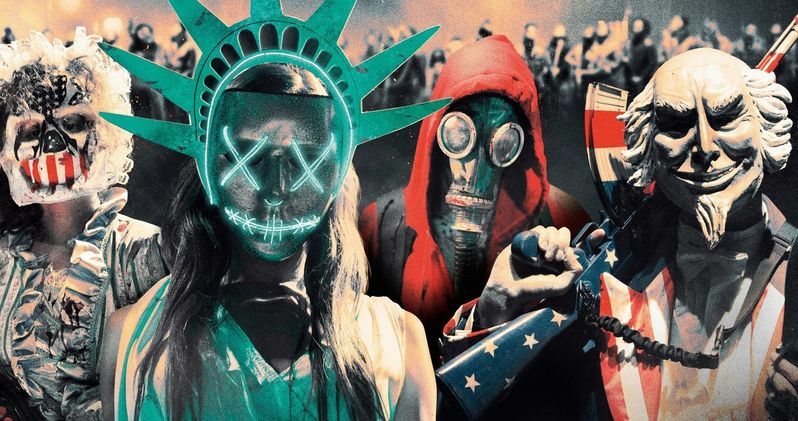 That trend will likely continue with The Purge: The Island, but with a new director and a pretty interesting story to tell, this movie could really get things back on the right track and finally put all of the pieces of the puzzle together and make a truly great horror movie for the 4th of July weekend next year.